So, on this basis, Rhosyfelin and Carn Goedog were deemed to be hugely important -- so important, in fact, that no control studies were undertaken at comparable sites, and nobody could be bothered to demonstrate that the features at the two sites were exceptional. As I have pointed out many times, the features described are entirely unexceptional -- and could be duplicated at scores of other sites throughout West Wales. What we see at Rhosyfelin we also see at Abermawr, Ogof Golchfa, and many coastal cliff and inland sites where sediments made up of rockfalls of thin-bedded rock debris have accumulated. What we see at Carn Goedog can also be seen at Carn Bica, Carn Meini and all of the other spotted dolerite tors of Preseli. MPP and his colleagues cannot be bothered to show that the features at Rhosyfelin and Carn Goedog are unique and deserving of special status -- and if we apply Hitchens's Razor we should really just ignore their research and get on with more important things in our lives. However, notoriety and glory beckon, and with a gullible media picking up on anything spectacular, no matter how nonsensical, the archaeologists happily play along, ignoring all of the principles of proper academic reporting and sound science. We have seen the same sort of thing in the recent research on strontium isotope ratios in cremated bone, with the authors attaching extraordinary significance to Preseli, Rhosyfelin and West Wales simply because Prof MPP told them all that that's where the bluestone quarries are. So the research contains such powerful bias that it should never really have been accepted for publication -- and all those who have read the paper carefully have expressed incredulity that it contains anything at all about West Wales, since no evidence of any sort is adduced to demonstrate a link between the cremated individuals and the bluestone source area. Now it's happening with Waun Mawn as well, already flagged up by Prof MPP as "proto-Stonehenge" -- the place where a standing stone circle was set up in the early or middle Neolithic and later dismantled and shipped off to Stonehenge. We have already seen "evidence" being twisted and misrepresented so as to fit the story -- to do with the local radiocarbon dating sequence, the size of the stones, their lithology, their places of origin, and the "sockets" from which they are supposed to have been taken. Within the next month, the diggers with their mechanical excavators will be laying waste to this particular part of the Preseli uplands, as they continue their obsessive hunt for the Holy Grail. But the "preparatory PR" has been carefully orchestrated, with the famous map (reproduced above) containing very carefully selected information so that the impression is given that spotted dolerite monoliths from Carn Goedog, foliated rhyolite monoliths from Rhosyfelin, and Palaeozoic sandstone monoliths from the Nevern headwaters were all taken to Waun Mawn and incorporated into a great stone circle. 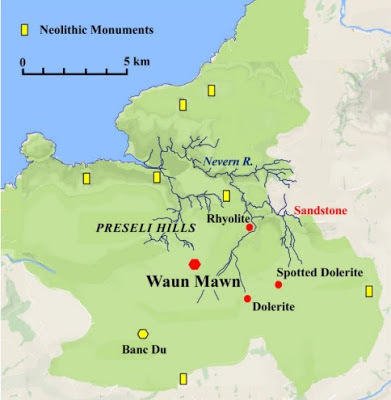 As I have pointed out, even a cursory look at the local geology and the local standing stones shows that (1) spotted dolerite has not been used preferentially in standing stone settings either at Waun Mawn or anywhere else; (2) Rhosyfelin rhyolite has only been used for standing stones in the immediate vicinity of the outcrops; (3) there is an abundant scatter of unspotted dolerite boulders, pillars and slabs from local outcrops within a couple of hundred metres of the "proto-Stonehenge" site, available for use; and (4) all of the standing stones at Waun Mawn and Tafarn y Bwlch appear to be made of unspotted dolerite, used more or less where found. MPP and his colleagues are now hostages to fortune, and it will be really interesting to see how they deal with whatever evidence that turns up, following all the hype. .. at first it sounded possible. Then I noticed their map of the Strontium levels. Hang on, I thought you said "West Wales"? But that's not what the map shows. Higher Strontium levels are spread all the way across the west of Britain, from Cornwall to Cape Wrath and beyond. "Previous strontium and oxygen isotopic research on human enamel concluded that the Beaker period (ca. 2400–1800 BC) ‘Boscombe Bowmen’ found near Stonehenge may have originated in west Wales, or perhaps from even further afield, in Brittany." "May", "perhaps"... Sharp-eyed readers will already have noticed the sleight of hand. "Strontium isotope analysis has also been used on cattle from Durrington Walls, a large henge monument near to and contemporary with the later phases at Stonehenge (ca. 2500 BC), with some individual animals showing more radiogenic signals typical of the older bedrock of western or northern Britain." Or northern?... like the cattle that were regularly driven from Northern Wales and Scotland all the way to Wiltshire and even London? Those with the highest values (>0.7110) point to a region with considerably older and more radiogenic lithologies, which would include parts of southwest England (Devon) and Wales (parsimony making locations further afield – including parts of Scotland, Ireland and continental Europe – less probable). Which kind of confirmed my first instinct from looking at the map. The more detail they reveal, the less likely it is that it's got anything at all to do with West Wales. It could be anywhere from Britanny to Devon to Scotland. The only way it got through any peer review process, I contend, would have been getting Lord Lucan (b 1934 - disappeared 1974) to do the Peer - reviewing, eh, what? Who's afraid of the big bad wolves?